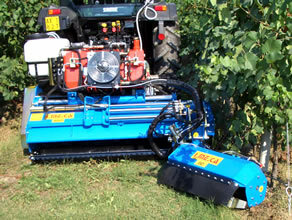 The application of one or two hydraulic mini shredders on the back of a PMS or RSM model it allows the regulation of work breadth to suit to every row width both on vineyards that on orchards. The machine is delivered with an autonomous hydraulic equipment with heat exchange, pumps and electro-hydraulic controls, and electric operations box in the tractor cabin. The posterior mini shredders are self levelling thanks to the presence of a four-sided suspension system. This system allows to perfectly follow the ground level independently from the central shredder on which they are anchored. The particular fixing system also allows the rotation in comparison to a horizontal longitudinal axle. It is available a operational device for ditches and humps which uses a tilting back shredding head and they can be rotated downward or upward with a hydraulic cylinder. In the inter-row version with one or two mini shredders, a feeler hydraulic system allows to cut the grass all around the row also in very closer vine plants.